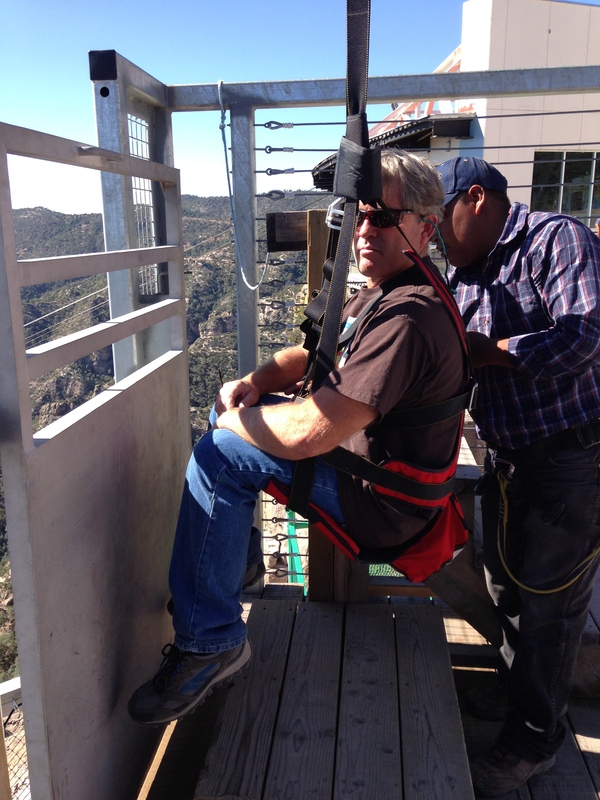 Barranca del Cobre = Copper Canyon | It's not a slow car, it's a fast house! 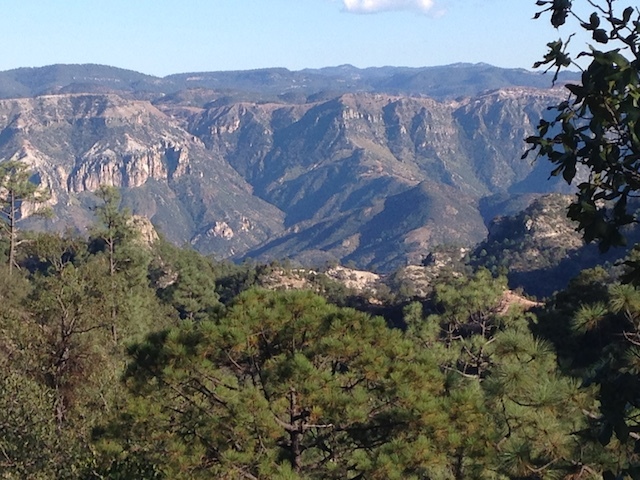 Barranca del Cobre does not disappoint. There is so much of it to see, and a wide variety of things to do. We packed as much as possible into the time we were there, but there are so many opportunities available. 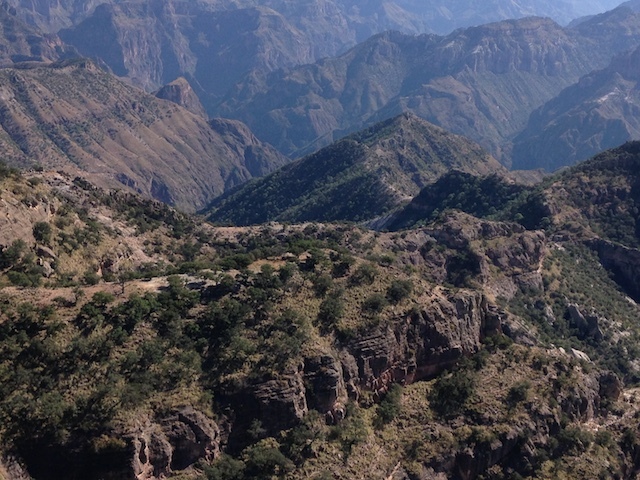 There are long, long hikes that view the Tarahumara villages and people and there are long, winding dirt roads that go to villages along the rim or waaaayyyy down in the bottom. We started our visit in Creel (because our books suggested that and we did not find further info) which was an interesting, bustling tourist town. 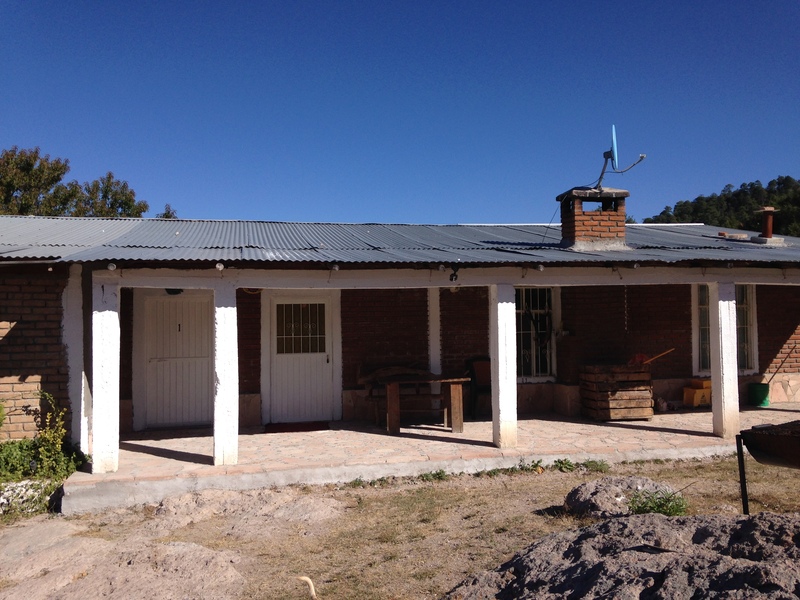 But aside from a genuine Tarahumara handcrafts store and a well-done museum, we could have skipped this stop. The RV park was formerly a KOA, so it had been nice at one time but was now simply a short cut from the school to the market. That meant a lot of foot traffic to antagonize the dogs. There was no hot water for showers, but the bathrooms were clean and a pleasant clubhouse environment. It was not set in a strikingly beautiful setting like so many of our other overnights, but it was functional. Creel offered a well-stocked Artisans Mercantile, which sold various items that were made by the natives and also items that the natives could by as raw materials (such as beads, leather straps, etc.) Their handiwork is brightly colored and well made. Without room for tchotchkes we had to be cautious, but we selected a few small items and also bought some home-made, bottled applesauce to support a school fundraiser. The museum is set up in the old train station. 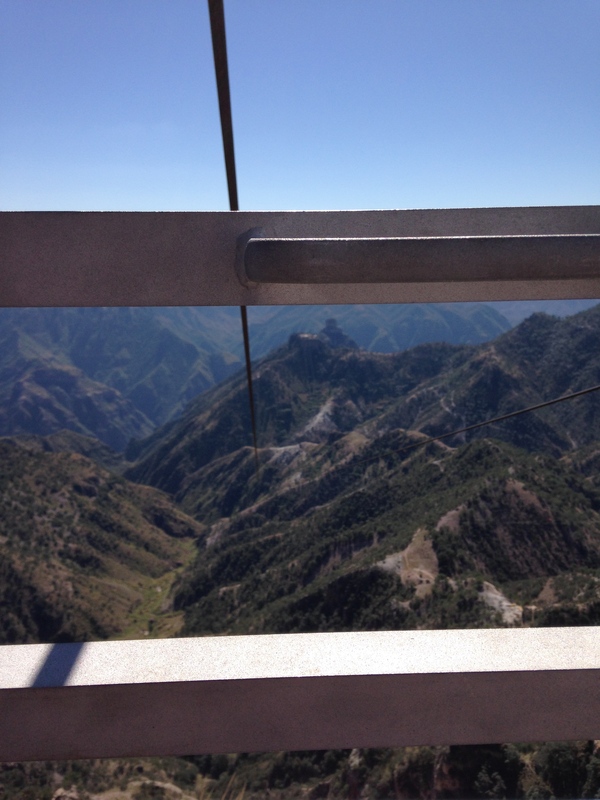 Seeing Copper Canyon by train used to be the only way to do it. The station is now modernized and up the street a ways. But this museum was worth the 10pesos admission price. We learned about history, religion, housing, peyote, clothing, courtship and games of the Tarahumara. The museum also sold more elaborate handcrafts including brightly colored dresses and sandals with leather thongs lacing tire treads to the soles. The items in these two stops seemed far from modern, while standing in this tourist town. But as we drove through the surrounding villages we saw that they were genuine. The women wore the brightly colored, gathered skirts and tops. The men and women wore the laced sandals, strapped to their legs in gladiator style. They carried the baskets and had the bright-colored blankets tied to their backs and filled with their burden to carry. 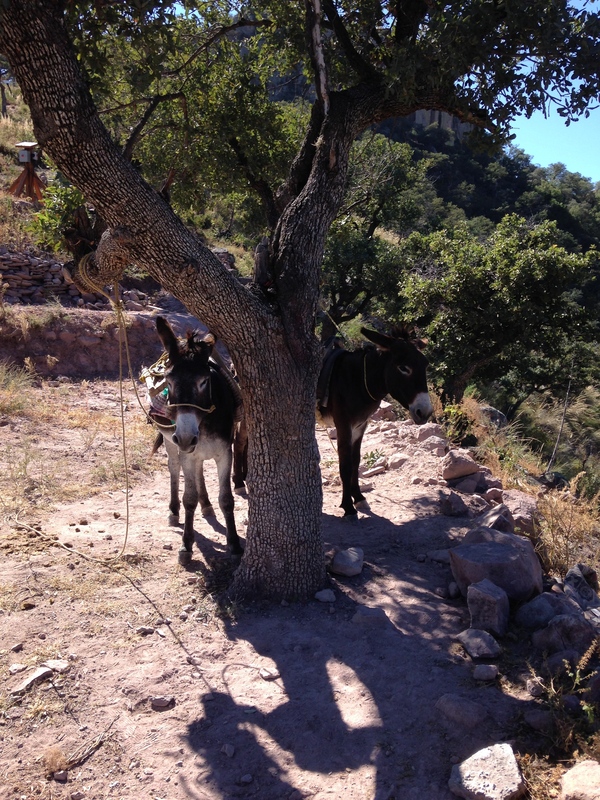 It was like taking a step back in time as we saw their adobe homes, cornfields, scraggly horses and apple trees. And then we saw the cave homes- tucked under the ledges of the canyon. Far away down trails that looked exhausting, but were a part of the daily commute for these native peoples. It was humbling and thought-provoking for us. After Creel we went to Divisadero. We were not sure of the options, road or lodging- but it seemed like a place to truly get a view of the canyon. It did not disappoint! 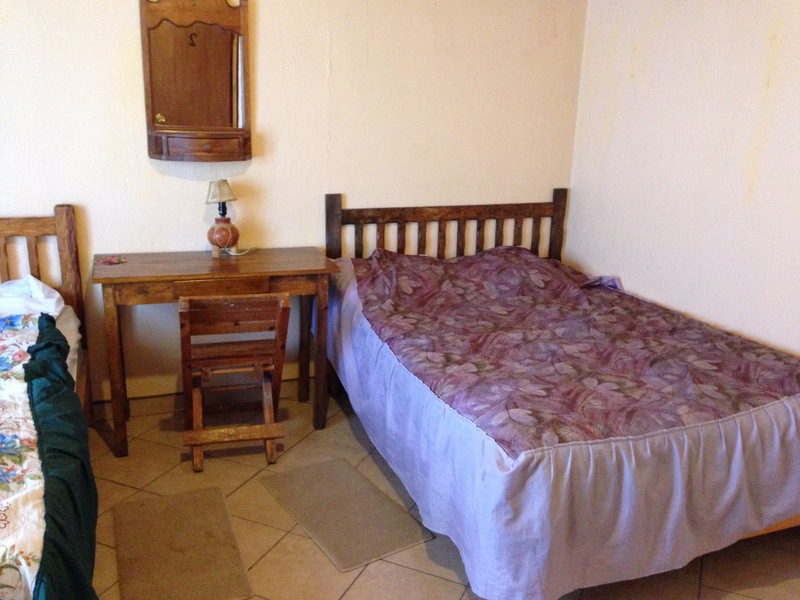 There is a lovely hotel there for folks that want a room on the rim. There are stands of natives selling their handcrafts, mixed with typical Mexican tourist junk. There was a food area that sold gorditas and rellenos made freshly over a metal 50 gallon fire-barrel on the spot. 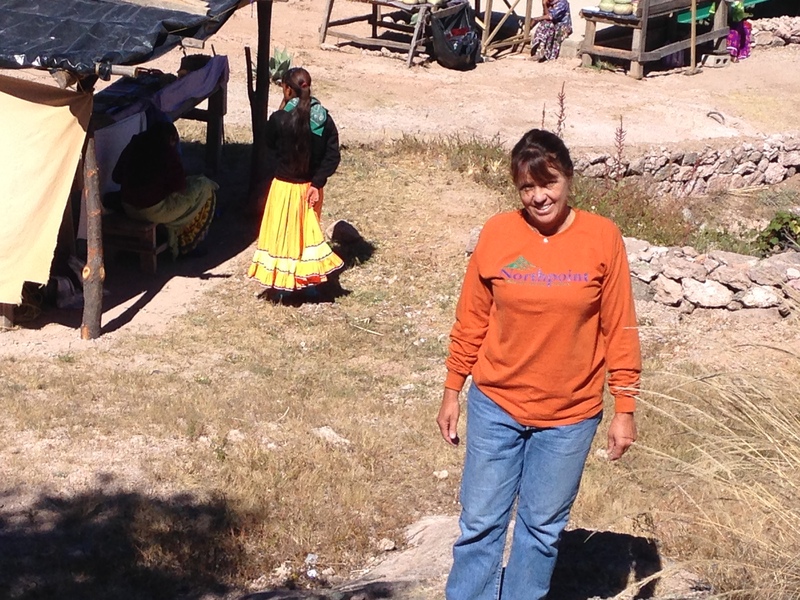 Repping the Northpoint shirt with the Tarahumara stands in the background. 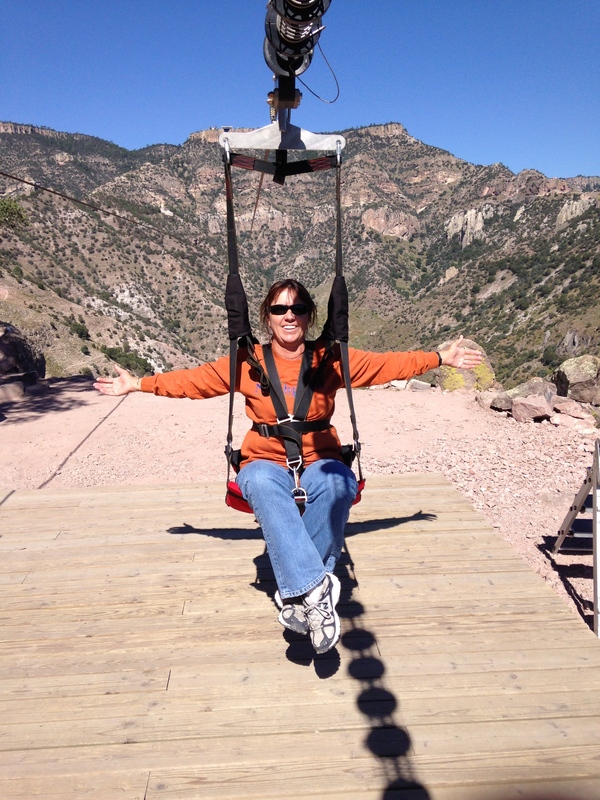 A bit further down the road took us to the adventure park or Barranca del Cobre Parque de Aventura. A modern style collection of entertainment for all ages. The main building had a restaurant, ticket sales, t-shirts and a cool floor area that was covered with Lexan. That section of the building hung out over the canyon and allowed you to walk over a 300-foot deep gorge below you. There was also a beautiful viewing deck. 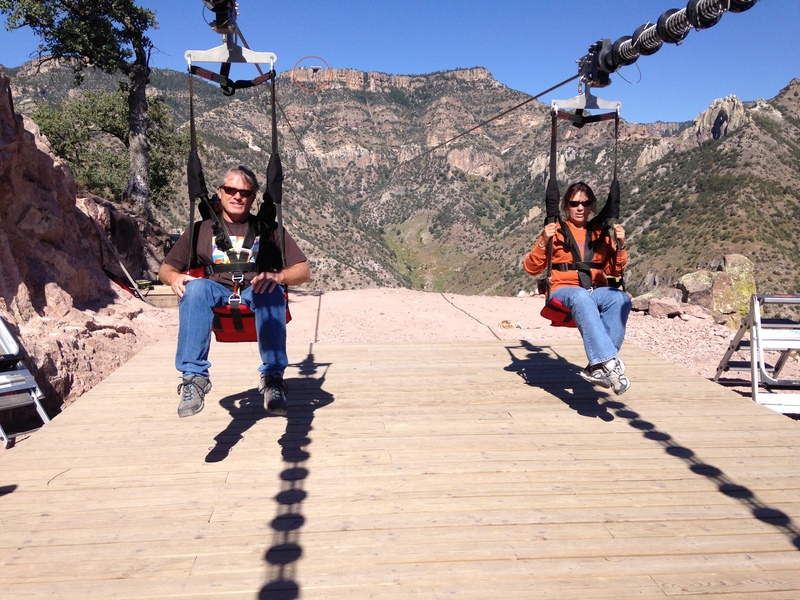 The attractions included some INTENSE mountain biking trails, a sky tram, rappelling and the ZipRider! It was too late to ride any of it when we arrived, but we could not resist the appeal of the ZipRider so we made arrangements to come back in the morning. We headed up to road a bit to the next village, Areponapuchi and found cabinas for rent. The host was terrific and the place was comfortable and clean. There was another group there and they turned out to be delightful to visit with. 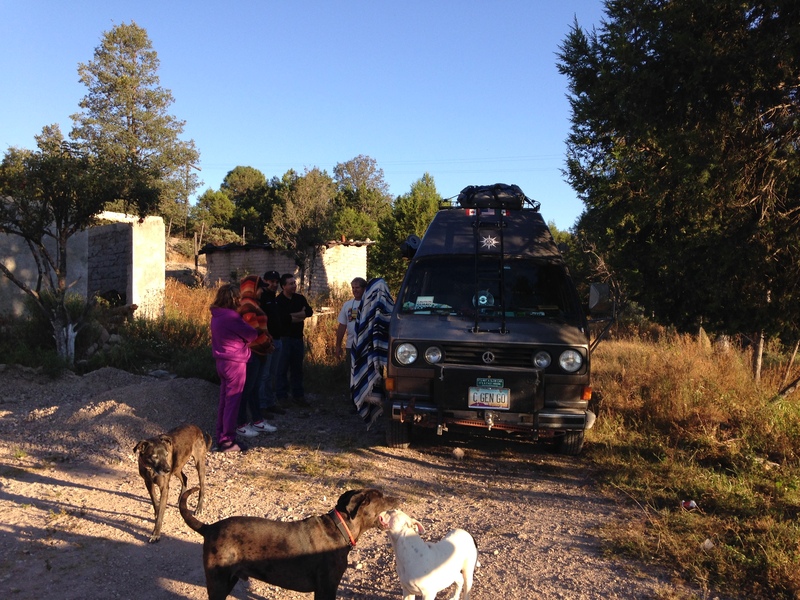 They were a family of 6 from Chihuahua that spoke enough English to express their interest in the van. We gave them a full tour while the snapped photos and asked questions. We “ordered” dinner (to be made by the neighbor lady) and Mike took the dogs for a hike to the rim of the canyon. The Copper CanyonTrail Head Inn at Areponapuchi. Areponapuchi bathroom. 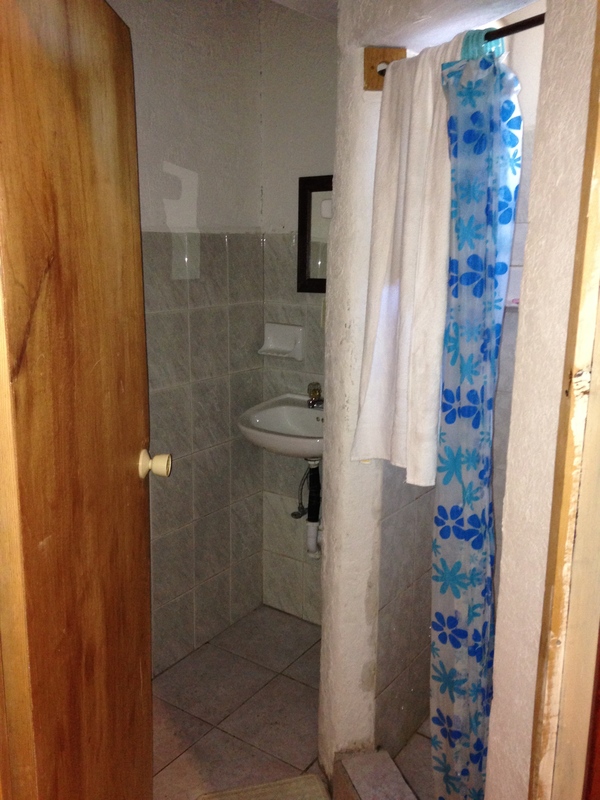 Pretty typical for a cheap, Mexican hotel. The room at Copper Canyon Trail Head Inn. A typical Mexican hotel. Giving a tour to the other guests at the inn, while the dogs meet the locals. 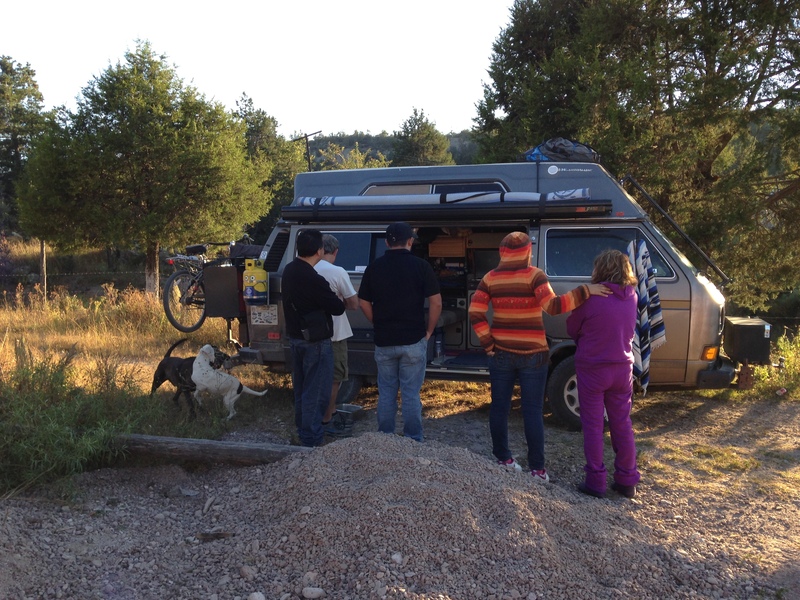 Mike is showing the van to an interested family from Chihuahua. Dinner was delivered by a 10 year old carrying a plastic tub. 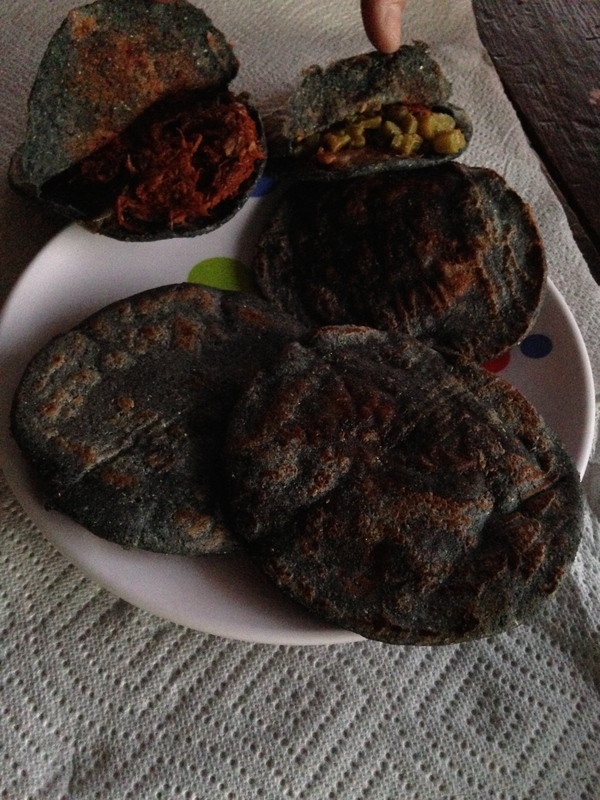 Inside was a pile of dark blue, round corn gorditas. Each was the size of a pita and had a pocket filled with various fillings. Some were shredded, spicy chicken. Some were refried beans with crumbled cheese and some were chopped ranchero style beef. Each one had small, juicy cubes of nopalitos (cactus pads) inside. It was a delicious meal and a fine way to end the day. Blue corn gorditas for dinner. Similar to a pita pocket sandwich, but warm and filled with various stuffings! The next morning we took our time getting to the Parque de Aventura and paid for our ZipRider trip. Although we felt nervous about the ride, the equipment was safe and the sights were unbeatable. We strapped in to our seats and answered “Si” when he asked if we were ready. The trip lasted FOREVER! The video quit at 2:29 and we still had a few minutes to coast. The views offered a new glimpse of the colors, the rock walls, the ledges with caves, the cornfields and the elaborate system of trails that the natives use to enter and exit the canyon. Upon landing, we hiked up an incline (past some burros) to the Sky Tram platform and were delivered back to the main building safely. It was a great experience! 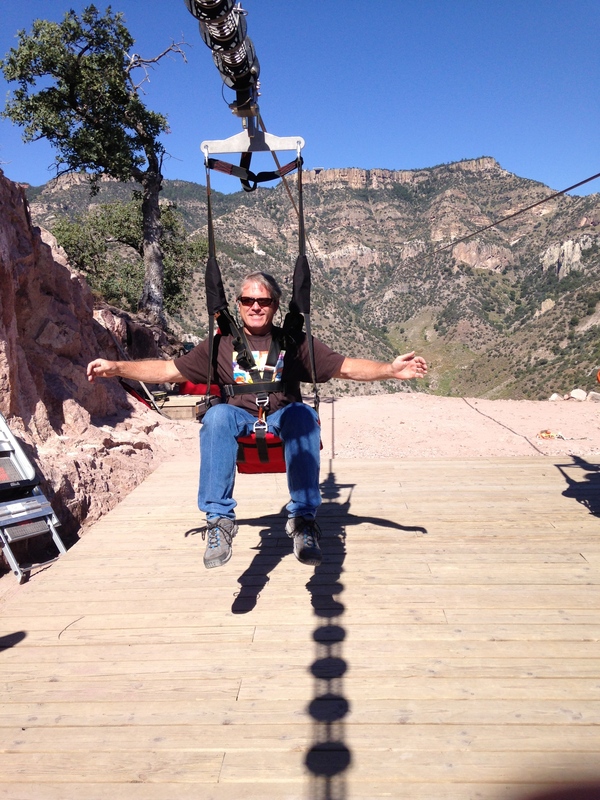 Mike is ready to go on the zip line! The line for the zip line seems to go on forever. After the zip line. We survived! The building at the top of the rim is where we left from! Wow! Whew! Yikes! 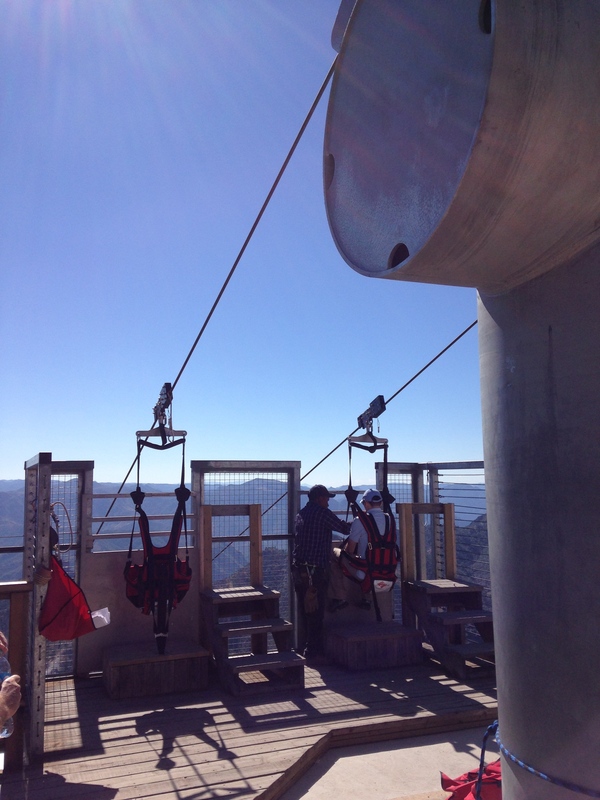 These trail workers carry the straps and rigging to the SkyTram so they can go back to the top for the next set of ZipRiders. 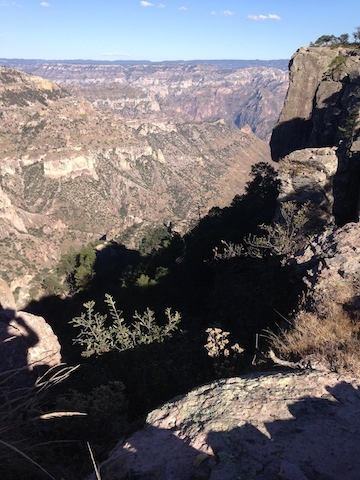 We left Barranca del Cobre (Copper Canyon) feeling as if we had learned a little bit about the canyon, the natives and the people of this area. We were ready to start back towards Arizona. Since we had just a few hours to drive, we headed back to Rancho San Lorenzo at Basaseachi to camp for the night. Then in the morning we departed for Hermosillo. A slow, steady and breathtaking drive through the Sierra Madres allowed us to say goodbye gradually to this region of Mexico. Adios, Chihuahua! If you look closely you can see the cave homes under the ledges. 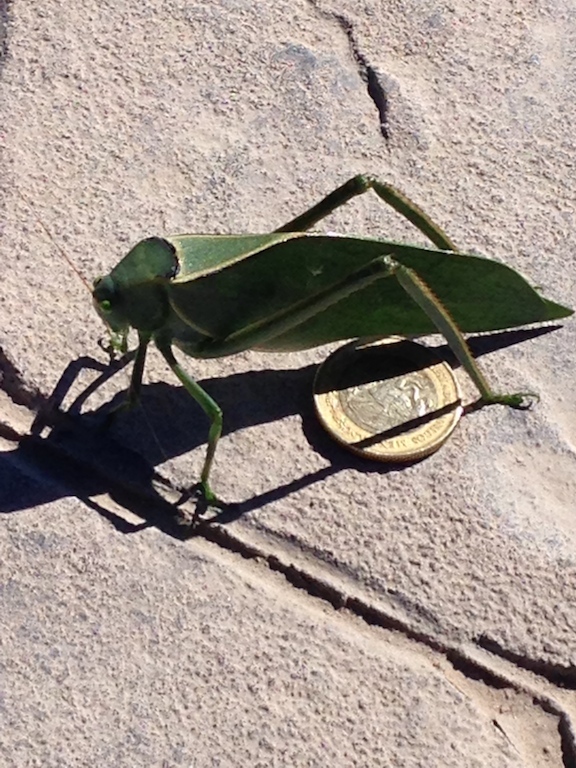 A HUGE grasshopper. There were 100’s of these at the Parque. 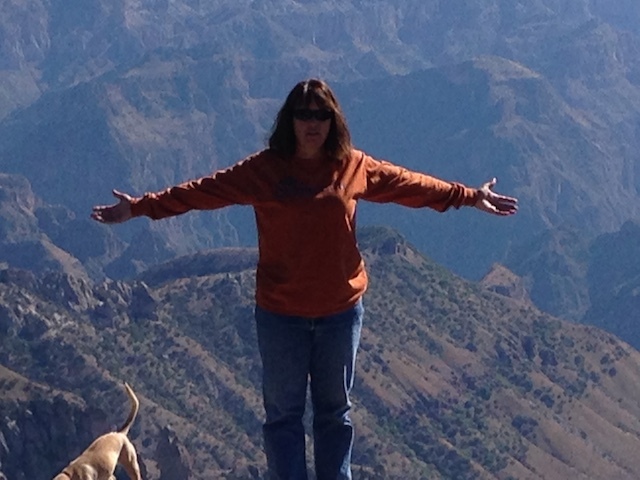 Copper Canyon is THIS BIG!! Panoramic to show the size/proportion. The red colorations in some areas look like Sedona. This canyon is larger than the Grand Canyon. Deeper, wider and more inlets and fingers than the Grand Canyon. 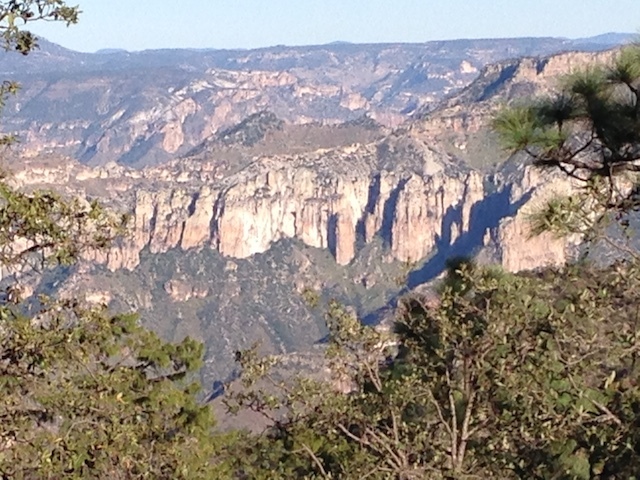 A panoramic shot of the distant rim of this huge canyon. 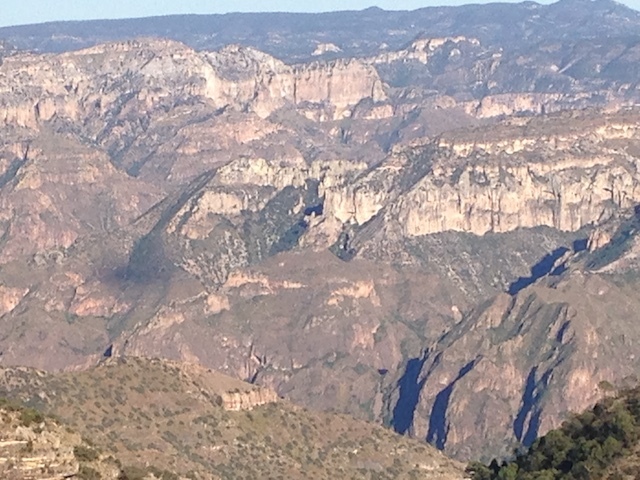 If you look closely you can see some of the trails that the Tarahumara use to get to the river Urique at the bottom. 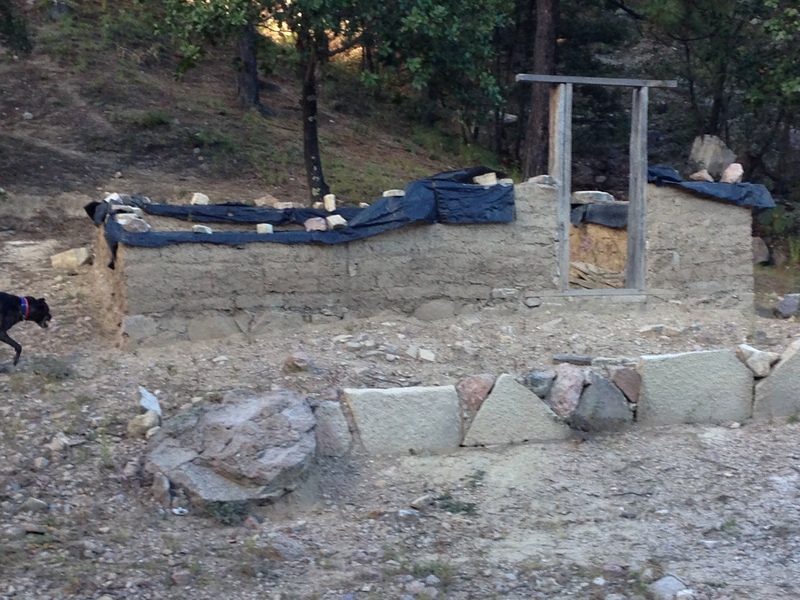 A Tarahumara home, under construction. Wow! I can’t find any better word or words! Wow! Now I know I have to go! It’s been on my list forever but it just got bumped up closer to the top. Some of the cave homes are abandoned, we found many while on our hike near Basaseachi Falls. 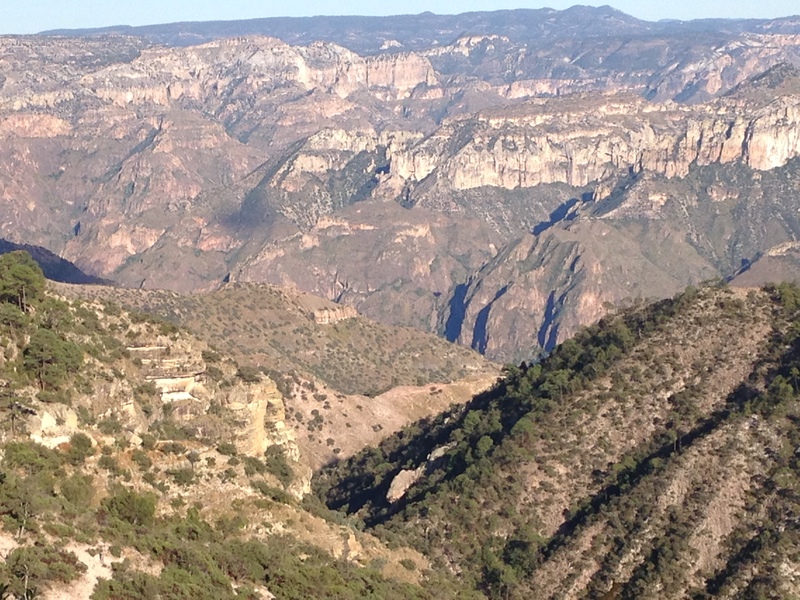 But near Copper Canyon, most are still in use. Are the cave homes still in use or more like our ruins?